Tiauna Mathieu (L’19) was inspired to become a lawyer, she says, in a sixth grade law and government class where half of the class served as the prosecution and half served as the defense. She went to Hampton University — and now Georgetown Law — to study criminal justice. Her mom is a warden in New York City’s Riker’s Island. Her aunt was a cop. Her dad, though, spent time in prison. Professor John Copacino and Professor from Practice Vida Johnson’s year-long Criminal Justice Clinic, which Mathieu is now taking as a 3L, is her favorite law school experience so far. In December, while many of her classmates were studying for exams, Mathieu was preparing for a trial where her client was accused of false reporting to a Metropolitan police officer (the December 5 trial would be postponed owing to the death of former President George H.W. Bush). She also worked on a simple assault case (the clinic only does misdemeanor cases). Her best experience was a win for a client faced with violating conditions of parole, which could have meant three to eight more months behind bars. It wasn’t Mathieu’s first experience working to better the lives of prisoners or ex-prisoners during law school. At an externship with the D.C. Council during Spring 2018, Mathieu learned about voter notification legislation that would inform ex-prisoners whether or not they were eligible to vote. 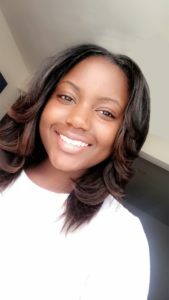 She wanted to help spread the word, so Mathieu began volunteering with the Inspiring Youth Program in a D.C. youth detention facility, teaching mock trial to 14 youths aged 15 to 17, under the supervision of Street Law Acting Director Charisma Howell. The mock trial was held in May. The biggest challenges? Unlike the typical Street Law high school program — in which Georgetown Law students teach the law to D.C. high schoolers — Mathieu’s students would disappear from her class if they were released released from prison or moved to an adult jail. But as with all youth, she also had to translate the mock trial vocabulary into terms that her students would understand. This year as a 3L, in addition to the clinic, she’s been exploring the intersection between gentrification and the criminal justice system in Professor Sheila Foster’s Urban Law and Policy class. She’s looking at how the gentrification of urban neighborhoods leads to a hyper-focus on minorities — the lifelong residents of those neighborhoods — as they engage in everyday activities. In her spare time, as president for the Christian Legal Society student group, she’s been collecting items such as socks, water, and sanitary supplies to distribute to the homeless population around Georgetown Law and Union Station. Mathieu spent her 2L summer at Hughes Hubbard in New York, working on white collar litigation. She’s looking forward to doing pro bono work there — particularly prison advocacy and representation — but she deferred her law firm offer for a year to clerk for Judge Edelman in Superior Court next year.